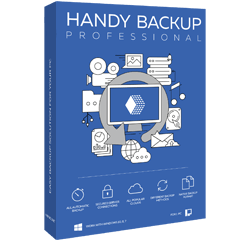 Handy Backup™ Professional is a speedy, effective and comprehensible utility capable for backing up data from personal computers including home, office and business-level workstations. 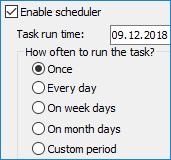 It is designed for users who need to back up not only files, but also pro-level data such as databases, websites or entire system images. Buy 2 for $178 $152! 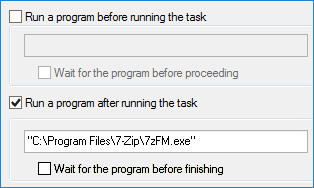 In the Professional edition, not only FTP servers are supported but also the protected FTP exchanging protocols, SFTP and FTPS. 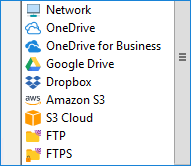 These features allow connecting with any type of FTP servers, for backing up such an information as website static content and secured FTP data. Learn more about FTP backup. * Database plug-in is developed for backing up tables of such databases as Access, FoxPro, Firebird, Sybase and other. To make full “hot” backup copies for MySQL, MS SQL, PostgreSQL and Oracle we recommend using Handy Backup Small Server or ordering plug-in for chosen database. Download Handy Backup, to try all the might of this solution by a free 30-days trial period.